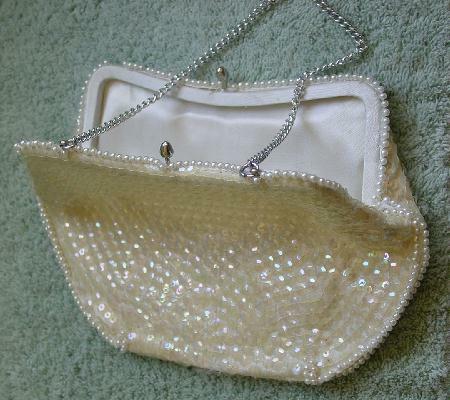 This vintage antique white evening bag is a Bag by Debbie, a division of John Wind Imports, and was made in Japan. It is covered with rows of iridescent sequins. The front has a wave pattern of small faux pearls. There are also three small four-leaf flowers in tiny faux pearls. 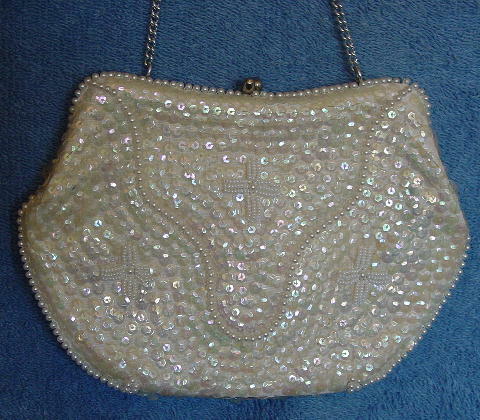 It has small faux pearls along the top, sides, and part of the bottom. The upper right corner rim has a couple of faux pearls missing, and the back left corner rim has one missing faux pearl. The interior lining is in antique white and there is an open interior pocket. It has a 12" long link chain and a bypass closure. She wore it to the New Year's Eve parties in South Beach.